Hello Friends!! 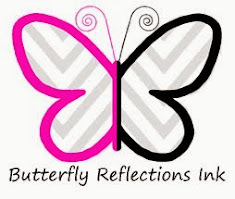 My name is Dana and I am so excited to be joining the Butterfly Reflections, Ink Design Team. I will be sharing a project every Friday on the blog, and I would love it if you would follow along!! Today, I have a card using the adorable Lawn Fawn: Let's Toast stamp set. I started my card by stamping all of my images with Memento Tuxedo Black Ink. Next, I used Copic Sketch Markers to color my images in soft shades of rainbow colors. Then, I used the Lawn Fawn: Let's Toast Lawn Cuts to cut out all of my images. Next, I cut a piece of white cardstock to 2.5 inches tall and stamped my sentiment. I attached all of my little pop tarts, toaster and butter to my white panel with 3D Dots Foam Adhesive. For my patterned paper I used the MFT Stamps: Sweet Celebration Paper Pad. This is a great 6x6 paper pad, lots of variety and wonderful colors!! To finish my card, I attached everything to my A2 card base. Enjoy your weekend and I will see you next Friday! !